It is not easy to write a new book about Alfred Hitchcock. Generations of film scholars cut their teeth studying his movies, which for many, were the gateway to cinephilia. Hitchcock movies were commercial films, and great entertainments – but with a formal brilliance that rewarded close study and repeated viewing, especially ideal for the obsessively inclined. He also left a vast and rich body of work, with distinct movements; films and phases ripe for contestation, rediscovery, and revisionism. Vertigo (1958), a commercial failure upon release, in 2012 displaced Citizen Kane (1941) in the Sight and Sound poll of the greatest films of all time. A Google scholar search for ‘Alfred Hitchcock’ yields over 20,000 results; amazon.com offers over 1,000 titles on the subject, including an earlier effort by Murray Pomerance, An Eye for Hitchcock (2004). Pomerance, a sociology professor at Ryerson University in Toronto, prolific writer on film studies, and editor on several film-related book series, returns to the master of suspense with Alfred Hitchcock’s America (hereafter AHA). Extensively researched, and proud of that obvious strength to the point of being a bit excessive in gratuitously detailed footnotes, AHA is organized thematically. An introductory chapter that situates Hitchcock in America is followed by chapters nominally focused on American scapes (that is, settings, landscapes, and architecture, public and private spaces), personalities, values, social form, and marriage. There is an early emphasis on post-war American urbanization, and the fundamental social transitions it implied: the shift from small town America of the nineteenth century to the “preponderantly urban and to a significant degree internationalized” country of the twenty-first century. Pomerance also offers insightful commentary on the gender dynamics of the McKenna’s marriage in The Man Who Knew Too Much (1956). But beyond these exceptions, AHA never develops a clear, defended, or even closely tracked argument or thesis. 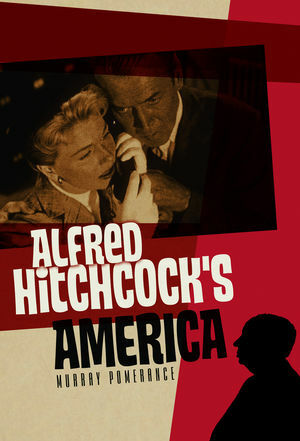 Despite the thematic titles of each chapter, there is no sustained continuity of purpose within them as each discussion moves from film to film – save for the repeated emphasis on Hitchcock’s attention to detail, which, ultimately and ironically, undermines claims of the ‘Americanness’ of Hitchcock’s movies. AHA has neither a concluding chapter nor even a summarizing statement near the end, underscoring the impression that the book’s strands are not easily tied together. The basic problem with AHA is that it never decides what, exactly, the phrase ‘Alfred Hitchcock’s America’ means. Is it the America of that time – in contrast to today, or perhaps as opposed to some other representation of that America? Or is it the distinct way that Hitchcock, as a British émigré, saw America? (Was it America that was different, or was Hitchcock’s America different?) Unfortunately, the book does not ultimately hone in on any of these, instead essentially using ‘America’ as a loose hook on which to hang a series of not intimately related discussions of various films. What such a hook precludes from discussion is an open question, yet the American theme is often forced, occasionally abandoned, and frequently shoehorned back late into the analysis. Stretching to impose an American theme often takes argument past its breaking point. In The Wrong Man (1956) we are told “Manny exemplifies all the finest and simplest American virtues: quietness, good manners, politeness to strangers, affection for his sons, loving duteousness toward his wife, respect for his mother.” (149) One shudders for all those societies within which these distinctly American virtues are absent. Similarly, is Ingrid Bergman, a Swede with an accent, who, in Hitchcock’s films played a psychoanalyst, the daughter of a Nazi spy, and a suffering Irishwoman living in 19th century Australia, best described as “an American girl of noticeable beauty”? (166) And what does the relationship between son and mother in Notorious (1946) – unreconstructed Nazi refugees living in postwar South America – tell us about America? Pomerance insists that their Oedipal relationship “has American resonance . . . for a whole generation of viewers” in the US, because it is seen through the eyes of Alicia (Bergman), who is “an Americanized European.” (234) That is quite a leap, though less heroic than the one that implies that the great German sociologist Georg Simmel, who died in 1918, in his “writing on marriage as a secret social relation” (270) has something specifically American to tell us about Alfred Hitchcock’s America. In addition to its unrequited core, or in some instances, as a consequence of this, other problems surface throughout AHA. One theme that is indeed sustained clearly throughout the book is Hitchcock’s insistence on – obsession is not too strong a word – authenticity of detail. Pomerance rightly notes “Hitchcock’s penchant for meticulous research.” (62) But he conflates this painstaking fixation on “realism” – that is, of accuracy – with the idea that these representations have a point to make about “America” beyond the simple desire to be as technically correct as conceivably possible. But the fact that Hitchcock routinely had researchers find out the exact uniforms worn by bellboys at a certain hotel, or things like the glassware used in a particular bar, or whether a salesman would eat his lunch at a booth rather than a counter, tells us only that Hitchcock wanted it exactly right – not that he cared about the content implied by the accurate representation of form. In a similar fashion, Hitchcock’s fondness for iconic locations was just that – a fondness for iconic locations – regardless of whether they were ‘American’ on not. Hitchcock could not resist a good American landmark: the Golden Gate Bridge in Vertigo, Grand Central Station in North by Northwest, The Hoover Dam and The Statue of Liberty in Saboteur (1942). But this penchant knew no nationality: they were of a kind with his featuring The British Museum in Blackmail (1929), St Paul’s Cathedral in Stage Fright (1950), Quebec City’s Parliament Building in I Confess (1953) and The Royal Albert Hall in The Man Who Knew Too Much (1956). A final shortcoming of Alfred Hitchcock’s America is that Pomerance does not instill confidence in the reader about his own facility with the American social and political culture of the period. Viewers in Cold War America, he assesses, “watched North by Northwest with a feeling that Hitchcock was touching their deepest nerves.” (224) This contrasts with Variety’s review at the time, which called the film a “delectable” concoction of “suspense, intrigue, comedy, humor.” (In 1999 J. Hoberman called it “Hitchcock’s ultimate wrong man comedy.”) Worse, Pomerance explains that contemporary Americans live in an environment “filled with explosive violence and tension, rampant secrecy, problems of knowledge and ignorance, public eruptions of feeling” whereas Hitchcock’s American films took place in a “very different” setting. (123) But the 1950s witnessed the Cold War, the U.S. nuclear strategy of “massive retaliation”, the rise of the national security state, secret FBI investigations into private lives, McCarthyism, and the upheavals of the civil rights movement. Strangers on a Train (1951) was released a few months after the McCarran Internal Security Act became law, which President Truman called “a long step towards totalitarianism”; Rear Window opened eleven weeks after Brown vs. Board of Education ruled that racial segregation in public schools was unconstitutional. It is certainly true that Hitchcock’s films did not reflect the violence, tension, rampant secrecy, problems of ignorance, and public eruptions that were taking place in the America he was living in. But this is because, in fact, and contra AHA, his films were set, more than anywhere else, in what could be called ‘Hitchcock-land’, a world in which guilt, insecurity and malevolence is hidden just below the surface of a nominally ordered society that presented a polished veneer of civilization and propriety. This does not suggest, finally, that Hitchcock didn’t have anything to say about America. But some of the most promising avenues in this regard are not pursued in AHA. Lifeboat (1944) is nothing less than a parsimonious deconstruction of American society, right down to the innocent nurse, her ‘US’ insignia glowing in the moonlight as she speaks of her ambivalence of returning to morally compromised Europe, just as her country had mixed feelings about once again getting embroiled in continental affairs. Other insights could surely have been gleaned from those moments when Hitchcock was aiming squarely at the broadest possible American audience – the episodes he directed for his popular, long running television show. These, and other silences, are disappointing.